This article is about the Nintendo Entertainment System and the Famicom game. For the Game Boy game, see Mega Man II (Game Boy). For the arcade game, see Mega Man 2: The Power Fighters. Mega Man 2[b] is an action game developed and published by Capcom for the Nintendo Entertainment System. It was released in Japan in 1988 and in North America and PAL regions the following years. Mega Man 2 continues Mega Man's battle against the evil Dr. Wily and his rogue robots. The game features graphical and gameplay changes from the first Mega Man game, many of which have remained throughout the series. Although sales for the original Mega Man were unimpressive, Capcom allowed the team to create a sequel. They worked concurrently on other Capcom projects, using their free time to develop the game, using unused content from the first game. Takashi Tateishi composed the soundtrack, with Yoshihiro Sakaguchi serving as a sound programmer. Mega Man 2 is the bestselling Mega Man game, with more than 1.5 million copies sold. Critics praised its audio, visuals and gameplay as an improvement over the first game. Many publications rank Mega Man 2 as the best game in the series and one of the greatest video games of all time. It has also been rereleased on several other consoles and made available on mobile phones. Mega Man 2 takes place one year after the original Mega Man. After his initial defeat Dr. Wily, the series' main antagonist, creates his own set of Robot Masters in an attempt to counter Mega Man: Metal Man, Air Man, Bubble Man, Quick Man, Crash Man, Flash Man, Heat Man, and Wood Man. He also constructs a new fortress and army of robotic henchmen. Mega Man is then sent by his creator, Dr. Light, to defeat Dr. Wily and his Robot Masters. Mega Man crushes the eight new Robot Masters and then challenges Wily himself. During the final fight, Dr. Wily flees into the caves beneath his fortress and when Mega Man follows, attempts to trick Mega Man into thinking he is a space alien, but Mega Man defeats the alien revealing it to be a holographic projection device which malfunctions showing Dr. Wily at the controls. After the scientist begs for mercy, Mega Man spares Wily and returns home. Mega Man uses the floating platform items to jump to an out-of-reach ladder in the Crash Man stage. After defeating the eight Robot Masters, the player proceeds to Dr. Wily's fortress, which consists of six levels that are played linearly. As in the first game, the player is required to fight each Robot Master a second time in Dr. Wily's fortress. However, these battles take place in a single room rather than a series of linearly connected rooms. The room contains teleportation devices that lead to each Robot Master. The devices can be entered in any order, but are not labeled. Once the bosses are defeated again, the player must fight Dr. Wily. So we, of our own accord, got together, spent our own time, we worked really, really hard, you know, just 20-hour days to complete this, because we were making something we wanted to make. Probably in all my years of actually being in a video game company, that was the best time of my working at Capcom, because we were actually working toward a goal, we were laying it all on the line, we were doing what we wanted to do. And it really showed in the game, because it’s a game, once again, that we put all our time and effort and love, so to speak, into it, designing it. The first Mega Man game—released in 1987—was not successful enough to justify the immediate development of a sequel. According to Roy Ozaki, director Akira Kitamura had wanted to make a sequel to Mega Man, but producer Tokuro Fujiwara was against it. Kitamura then went to Capcom Vice-President to get permission to make the game. Capcom allowed the development team to create a sequel on the condition that they work concurrently on other projects as well. The staff spent their own time on the project to improve upon the original by adding more levels and weapons, as well as improving the graphics. The project supervisor of the first Mega Man invited Inafune to the sequel's development crew; Inafune was working on a separate game at the time. On the previous game, Inafune worked as an artist and character designer but became more involved in the production process of the sequel. "Working on [Mega Man 2] marked my second year at this, and I even got to mentor a 'new kid', which opened up a whole new world of stress for me," Inafune recounted. The development time for the game was only three to four months. Due to the limited amount of cartridge space available for the first game, elements such as planned enemy characters were omitted from the final product. The unused content was later transferred to Mega Man 2. The team was limited by the graphical capabilities of the console, and designed characters as pixel art to maintain consistency between the designs and final product; some design elements, however, were lost in the transition. The gameplay system from the original game was kept for Mega Man 2, but the team included more traps for the player to navigate. The game's three support items were added to aid the player because of complaints from consumers and Capcom's marketing department regarding the original game's high difficulty. Inafune's supervisor was "especially unsure" about the usefulness of the Energy Tanks. The first game did not have any influence from fans, but for the second game, Kitamura wanted to get ideas from players and put them in. The developers allowed input from the public by including boss designs created by fans. Capcom received 8,370 boss submissions for the game, although even the designs for the final eight Robot Masters were "tweaked". Inafune intended his artwork for Mega Man 2 to be more "anime-ish" than in the first game. A second difficulty setting was added for the North American release. The original version was labeled "difficult", and a "normal" setting was created that made the "arm cannon" and boss weapons more powerful. The soundtrack for Mega Man 2 was composed by Takashi Tateishi (credited as Ogeretsu Kun), with Mega Man composer Manami Matsumae (credited as Manami Ietel) co-composing a minor part of the melody for Air Man's stage. As with the previous game, the sound programming was handled by Yoshihiro Sakaguchi, credited as Yuukichan's Papa. Veteran video game cover illustrator Marc Ericksen painted the North American box art, which included Mega Man firing a pistol instead of his trademark Mega Buster. Ericksen explained, "I didn't know anything about Mega Man, and [after looking at the character in action] I said to the art director, 'What is he shooting with?' ... He said, 'Well, he must have a pistol, because I don't see a rifle.' ... I said, 'So, a pistol? Do you want me to do a pistol?' And he said, 'Yeah, let's put a pistol in there.' So I did what I was told and I put the pistol in there. Add to the fact that they only had, like, a day and a half for me to do the painting and what you wound up with was not the greatest result. But certainly a result that was not my fault. I mean, they told me to put the pistol in his hand!" Though the first Mega Man game had relatively low sales, Mega Man 2 was a huge success. Since its 1988 release, Mega Man 2 has sold over 1.5 million copies worldwide. The game is the highest selling in the Mega Man series and Capcom's 41st highest-selling game. Mega Man 2 was critically praised. Electronic Gaming Monthly's four reviewers—Steve Harris, Ed Semrad, Donn Nauert, and Jim Allee—rated the game favorably. They stated that it was better than the first Mega Man, citing the improved audio-visuals, new power-ups, and password system. Nauert and Allee, however, expressed disappointment that the game was less difficult than the first game. Nadia Oxford of 1UP.com complimented its aesthetics and gameplay. She further stated that Mega Man 2 improved the gameplay of its predecessor by removing excessively difficult elements. Mean Machines' two reviewers, Julian Rignall and Matt Regan, praised several aspects of the game. Rignall lauded the gameplay, citing its addictiveness and the puzzles. Regan praised the difficulty and called the gameplay balanced. Both reviewers complimented the graphics, calling them detailed and stunning, and described it as a great platform game. Retro Gamer editor Richard Burton described it as a "must-have" game for the system, comments echoed by two of Electronic Gaming Monthly's reviewers. Zach Miller writing for Game Informer attributed the success of the game to the players' option to defeat the stages in the order of their choosing. He praised the simple control scheme and the variety of weapons and items. GamesRadar ranked it the second-best NES game ever made, calling it "the pinnacle" of the 8-bit Mega Man games. The game's soundtrack has been well received by critics. Joey Becht of IGN listed three stage themes from Mega Man 2 along with the main title song among the best in the series. In 2008, Game Informer listed Mega Man 2's introduction sequence as the fifth-best video game opening, citing the build up of excitement that the music and appearance of the character instills. The "Doctor Wily Stage Theme" was ranked second in ScrewAttack's "Top 10 Video Game Themes Ever" video. Nintendo Power' editorial staff praised the music in 2008, stating it is among the best on the platform. In 2009, Gamasutra's Brandon Sheffield describe the music as easily recognizable and lamented that contemporary video game music lacked that trait. Mega Man 2 is a favorite among Mega Man fans, with many calling it the best in the series. Critics have also referred to the game as the series' best. Oxford considered it one of the most memorable game in the series, and Burton called the game the best in the series. IGN's Levi Buchanan listed three of the game's bosses among the "Top 10 Mega Man Robot Masters". Several publications consider the game a critical success and have listed it high on "top game" lists. At the end of 1989, it was the top ranked game on Nintendo Power's Top 30 list. In August 2008, Nintendo Power listed Mega Man 2 as the third best Nintendo Entertainment System video game. The editorial staff praised the polished improvements over the previous game. GameSpot named Mega Man 2 as one of "The Greatest Games of All Time". It ranked number 33 in Nintendo Power's "Top 200 Nintendo Games Ever" list and number 60 in Official Nintendo Magazine's "100 Best Nintendo Games" list. Miller considered it one of the greatest games of all time. In 2007, IGN's three editorial offices—United States, United Kingdom, and Australia—compiled a list of top 100 games. They listed Mega Man 2 as number 67, citing the action and strategic elements along with the impact it had on the series. Mega Man 2 was placed 4th on IGN's list of the Top 100 NES Games. Mega Man 2 was the first game on the cover of Electronic Gaming Monthly. Kitamura chose to leave Capcom and joined the company Takeru, where he worked on the game Cocoron instead of Mega Man 3. Keiji Inafune claims the success of Mega Man 2 is what made the Mega Man series a hit that continues to spawn sequels. 1UP.com commented that the game helped establish the series as a prominent and commercially successful video game franchise. IGN cited Mega Man 2 as helping define the platforming genre. Retro Gamer credited it with helping the series obtain the global presence that allowed spin-offs and more sequels to be created. Many of the conventions of the original Mega Man series were defined by the first game, but Mega Man 2 added crucial conventions that were retained for the rest of the series. The traditional number of Robot Masters for the series is eight as used in Mega Man 2, rather than the six used in the original. It was the first in the series to include an opening cinematic. Mega Man 2 also introduced the Energy Tank item, special movement items, teleporter room, and password system, which became staples in future games. The Energy Tank became the series' iconic health refill item and later served as inspiration for a promotional "Rockman E-Can" drink. In developing Mega Man 9, producer Inafune and Hironobu Takeshita looked to the first two games in the series for inspiration, with Mega Man 2 serving as a standard to surpass in order to meet fans' expectations. Mega Man Universe was to feature a remake of Mega Man 2's story campaign, as well as feature customizable characters and levels. However, Capcom has officially announced the game's cancellation due to "various circumstances." In Super Smash Bros. for Nintendo 3DS and Wii U, Wily Castle, as depicted in Mega Man 2, appears as a selectable stage in both versions of the game. In 1990, Tiger Electronics produced a handheld electronic version with abridged gameplay. Mega Man 2 was remade in 1994 for the Sega Genesis game Mega Man: The Wily Wars, featuring updated graphics and sound. In 1999, Mega Man 2 was rereleased for the PlayStation as the second of six Rockman Complete Works discs, though only in Japan and under the original title Rockman 2. It is largely identical to the original NES release, but had a number of bonuses, such as a "navi mode" for beginners that presents the player with a slightly remade version of the game, detailed encyclopedic content, image galleries, and remixed music. Mega Man 2 was included with nine other games in the series in Mega Man Anniversary Collection for the PlayStation 2, GameCube, and Xbox, released between 2004 and 2005. The game's emulation is identical to the re-release contained in Rockman Complete Works. Also in 2005, Mega Man 2 was released alongside other Capcom games as part of a "Plug It In & Play TV Games" peripheral by Jakks Pacific. 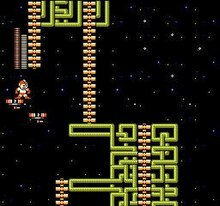 Mega Man 2 made its way to mobile phones in 2007. The game was added as a part of the Wii Virtual Console service in PAL regions on December 14, 2007. In celebration of the ninth game's release in September 2008, Capcom Japan released the game on August 26, 2008 in Japan and a North American release on September 15, 2008. In March 2009, Capcom released the game for iPhone OS, while in September of the same year the Complete Works version of Mega Man 2 was released on the Japanese PlayStation Store, making it available for download on the PlayStation 3 and PlayStation Portable. Inafune expressed a desire to remake Mega Man 2, similar to Mega Man Powered Up, but stated that such a project was dependent on the commercial success of the latter. A tech demo for the Nintendo 3DS called Classic Games was shown at E3 2010, displaying more than a dozen classic games, including Mega Man 2, using 3D effects. Reggie Fils-Aime announced that the games were slated for release on the 3DS and would possibly use the 3DS' features, such as 3D effects, analog control, or camera support. The game was released on the 3DS via the Virtual Console in Japan on August 8, 2012 and was released in Europe and North America on February 7, 2013. Mega Man 2 was novelized in the Worlds of Power series published by Scholastic in 1990. The novel mostly follows the game, even offering game hints at the end of some chapters. Besides the added dialogue, the one major variation in the novel is that Dr. Light fears Mega Man's chances against Dr. Wily's more powerful new robots and while attempting to duplicate him, accidentally turns him into a human being, a difficulty Mega Man must endure throughout the story. The book's cover also lacks the gun depicted on the North American box art of the game, due to a "no weapons" policy that Worlds of Power writers had to abide by. The game was also adapted into the third story arc for the Archie Comics Mega Man comic, "The Return of Dr. Wily." In the arc, the Robot Masters are intended to either defeat Mega Man or infect him with a virus bit by bit as he absorbs their Special Weapons. All the Robot Masters are defeated but Mega Man ends up under Dr. Wily's control until the Mega Man Powered Up Robot Masters come to his rescue. Dr. Wily escapes and sets his course for the Lanfront Ruins in South America, foreshadowing an adaptation of Super Adventure Rockman. ^ a b c d e f g Mega Man: Official Complete Works. Udon Entertainment. January 6, 2010. pp. 10–5. ISBN 978-1-897376-79-9. ^ a b c Rignall, Julian; Matt Regan (January 1991). "Mega Man II Review". Mean Machines. No. 4. EMAP. pp. 16–19. ISSN 0960-4952. ^ a b Mega Man: Official Complete Works. Udon Entertainment. January 6, 2010. pp. 96–7. ISBN 978-1-897376-79-9. ^ Vasconcellos, Eduardo (June 26, 2007). "Mega Man II Review". IGN. Retrieved June 8, 2017. ^ a b Buchanan, Levi (March 26, 2009). "Mega Man II on App Store". IGN. Retrieved June 8, 2017. ^ a b c d e Nintendo Power Staff (July – August 1989). 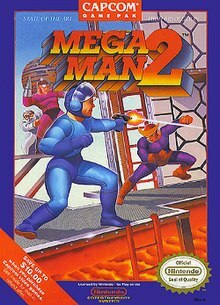 "Mega Man II". Nintendo Power. No. 7. Nintendo of America. pp. 8–23. ISSN 1041-9551. ^ a b c d e Retro Gamer Staff (May 2008). "The Classic Game: Mega Man II". Retro Gamer. No. 49. Imagine Publishing. pp. 36–7. ISSN 1742-3155. ^ a b c d Capcom, ed. (July 1989). Mega Man 2 Instruction Booklet. Capcom. pp. 6–9. ^ a b Hoffman, Chris (April 2004). "The Best Damn Mega Man Feature Period". Play. Vol. 3 no. 4. Imagine Publishing. ISSN 1747-7859. ^ a b c Hoffman, Chris (September 2007). "Playback: Mega Man 2". Nintendo Power. No. 219. Nintendo of America. p. 82. ISSN 1041-9551. ^ Szczepaniak, S.M.G (2014). The Untold History of Japanese Game Developers: Gold. America: SMG Szczepaniak. p. 238. ISBN 0992926025. ^ Szczepaniak, S.M.G (2014). The Untold History of Japanese Game Developers: Gold. America: SMG Szczepaniak. p. 240. ISBN 0992926025. ^ IGN Staff. "Top 100 Game Creators of All Time: Keiji Inafune". IGN. Archived from the original on March 6, 2009. Retrieved July 27, 2009. ^ a b c Oxford, Nadia (May 10, 2007). "Mega Man Retrospective: Getting Equipped With 20 Years". 1UP.com. Ziff Davis. Archived from the original on January 1, 2013. Retrieved August 10, 2007. ^ a b c d Elston, Brett (July 23, 2008). "Mega Man 9 - exclusive interview with the mind behind the machines". GamesRadar. Future plc. Retrieved July 27, 2009. ^ Inafune, Keiji (1997). "Rockman 10th Anniversary Celebration Plans". CFC Style Fan-Book (in Japanese). Capcom. 3: 24. ^ Interviewee: Keiji Inafune (November 20, 2003). "Mega Man". Game Makers. Season 2. Episode 19. G4. Archived from the original on September 17, 2011. ^ Szczepaniak, S.M.G (2014). The Untold History of Japanese Game Developers: Gold. America: SMG Szczepaniak. p. 759. ISBN 0992926025. ^ Niizumi, Hirohiko (September 23, 2007). "TGS '07: Mega Man celebrates 20th anniversary". GameSpot. CBS Interactive. Retrieved May 25, 2010. ^ Mega Man: Official Complete Works. Udon Entertainment. January 6, 2010. pp. 118–9. ISBN 978-1-897376-79-9. ^ a b c d e IGN Staff (2007). "IGN Top 100 Games 2007: 67 Mega Man 2". IGN. Archived from the original on April 10, 2017. Retrieved July 3, 2009. ^ Taher, Mohammed. "A Conversation with Manami Matsumae". Koopa Soundworks. Retrieved August 19, 2015. ^ Greening, Chris. "Interview with the Mega Man 1 & 2 Sound Team: Reunited 20 Years On". Square Enix Music Online. Retrieved February 19, 2011. ^ Ericksen, Marc. "MegaMan 2, What's with the pistol??!!". Retrieved June 16, 2013. ^ a b c Harris, Stever; Ed Semrad; Donn Nauert; Jim Allee (July 1989). "Electronic Gaming Review Crew". Electronic Gaming Monthly. No. 2. Ziff Davis. p. 11. ISSN 1058-918X. ^ Famitsu staff (January 6, 1989). クロスレビュー [Cross Review]. Weekly Famitsu (in Japanese). No. 65. Enterbrain. p. 19. ^ a b c d e Thomas, Lucas M. (September 16, 2008). "Mega Man 2 Review". IGN. Archived from the original on May 15, 2012. Retrieved July 4, 2009. ^ Andy (June 1992). "Life, the Universe and Nintendo Games". Total!. Future Publishing. ISSN 0964-9352. ^ Capcom staff. "Capcom Platinum Titles". Capcom. Archived from the original on February 8, 2015. Retrieved July 22, 2010. ^ a b Burton, Richard (September 2008). "Back to the Nineties: The Latest News from January 1991". Retro Gamer. No. 54. Imagine Publishing. p. 22. ISSN 1742-3155. ^ a b Miller, Zach (January 2007). "Greatest Game of All Time". Game Informer. No. 165. GameStop. p. 121. ISSN 1067-6392. ^ a b Becht, Joey (October 31, 2008). "Top 10 Mega Man Musical Moments". IGN. Archived from the original on September 10, 2009. Retrieved July 3, 2009. ^ Game Informer Staff (November 2008). "The Top Ten Video Game Openings". Game Informer. No. 187. GameStop. p. 38. ISSN 1067-6392. ^ ScrewAttack staff (2008). "Top 10 Video Game Themes Ever". ScrewAttack. ScrewAttack's Top 10. GameTrailers. Retrieved November 11, 2008. ^ a b Nintendo Power staff (August 2008). "Nintendo Power: The 20th Anniversary Issue!". Nintendo Power. No. 231. Future US. p. 71. ISSN 1041-9551. ^ Sheffield, Brandon (May 1, 2009). "Opinion: What's Wrong With Game Music?". Gamasutra. UBM plc. Retrieved July 4, 2009. ^ a b Nutt, Christian (August 4, 2008). "He Is 8-Bit: Capcom's Hironobu Takeshita Speaks". Gamasutra. UBM plc. Retrieved July 4, 2009. ^ a b Bailey, Kat. "Top 5 Overlooked Prequels". 1UP.com. Ziff Davis. Archived from the original on February 25, 2009. Retrieved July 4, 2009. ^ Buchanan, Levi (July 1, 2008). "Top 10 Mega Man Robot Masters". IGN. Retrieved July 3, 2009. ^ Nintendo Power Staff (September – October 1989). "Nintendo Power Top 30". Nintendo Power. No. 9. Nintendo of America. p. 80. ISSN 1041-9551. ^ GameSpot Staff (October 24, 2003). "The Greatest Games of All Time". GameSpot. CBS Interactive. Archived from the original on September 17, 2006. Retrieved June 11, 2006. ^ Nintendo Power staff (February 2006). "NP Top 200". Nintendo Power. No. 200. Nintendo of America. p. 59. ISSN 1041-9551. ^ East, Tom (February 23, 2009). "100 Best Nintendo Games: Part 3". Official Nintendo Magazine. Future plc. Archived from the original on August 31, 2009. Retrieved November 29, 2009. ^ IGN Staff (2011). "Top 100 NES Games - #4 Mega Man 2". IGN. Retrieved February 4, 2013. ^ RacketBoy (2012). "First Issue of Electronic Gaming Monthly". Racketboy. Retrieved April 20, 2016. ^ Pane, Salvatore. "How Mega Man Survived Its Creator Leaving Capcom". Kotaku. Retrieved August 15, 2018. ^ Kohler, Chris (August 15, 2008). "Guzzle Some Mega Man E-Tank Drinks". Wired. Condé Nast Publications. Retrieved August 25, 2008. ^ Dutton, Fred (September 18, 2010). "Mega Man Universe based on Mega Man 2 News". Eurogamer. Retrieved January 21, 2011. ^ Ashcraft, Brian (March 31, 2011). "Mega Man Universe Is Totally Canceled". Kotaku. Gawker Media. Retrieved March 10, 2012. ^ Tiger Electronics, ed. (1990). 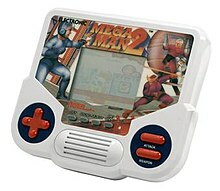 Electronic Mega Man 2 LCD Game. Tiger Electronics. Model 7-811. ^ Elston, Brett (June 30, 2008). "The ultimate Mega Man retrospective". GamesRadar. Future plc. Retrieved January 3, 2011. ^ Nutt, Christian & Speer, Justin. "The History of Mega Man". GameSpot. CBS Interactive. Retrieved August 20, 2007. ^ Parish, Jeremy (June 22, 2004). "Mega Man Anniversary Collection (PS2)". 1UP.com. Ziff Davis. Archived from the original on May 30, 2012. Retrieved August 20, 2007. ^ "JAKKS Pacific Offers TV Games GameKey For Classic Capcom Games". Toy News International. March 9, 2005. Retrieved January 7, 2011. ^ Stern, Zack (April 13, 2007). "Street Fighter, Mega Man on mobile phones". Joystiq. AOL. Retrieved August 15, 2007. ^ Capcom staff. "Capcom News". Capcom. Archived from the original on August 22, 2008. Retrieved October 12, 2008. ^ Spencer (September 9, 2009). "Mega Man 2 Brings Robot Fish To PS3, PSP". Siliconera. Retrieved September 9, 2009. ^ Theobald, Phil (September 17, 2005). "Mega Man on PSP -- Keiji Inafune and Tatsuya Kitabayashi Interview". GameSpy. IGN. Retrieved July 27, 2009. ^ Jackson, Mike (June 20, 2010). "SNES, NES classics set for 3DS return". Computer and Video Games. Future plc. Retrieved June 21, 2010. ^ Ishaan (August 3, 2012). "Mega Man 2 Blasts To 3DS Virtual Console In Japan Next Week". Siliconera. Retrieved August 5, 2012. ^ a b Miles, Ellen (1990). Mega Man 2. New York, NY: Scholastic, Inc. pp. 4–6, 16, 23, 36, 39, 50, 57, 61, 66, 71. ISBN 0-590-43772-0. ^ Struck, Shawn; Scott Sharkey (August 3, 2006). "8-Bit Lit: Behind the NES' Worlds of Power Series". 1UP.com. Ziff Davis. Archived from the original on May 30, 2012. Retrieved August 9, 2007.